It was a refreshing weekend in Albuquerque, NM, for several reasons. Since I had to use my snow blower three times before I left, it was great to see the sun and feel 60 degree weather again. More importantly, it was very refreshing to have the opportunity to explore human patterning and performance with so many individuals new to the science of PRI. The introduction of the concepts of neutrality and asymmetry started our weekend. And those concepts were followed by why and how does the L AIC pattern develop and become the dominant neuromechanical pattern in our body. And that lead us into our conversation of normal mechanics vs. normal compensatory mechanics vs. pathological mechanics due to this dominant L AIC pattern. As we moved into myokinematic behavior as a result of the L AIC pattern, Karen Bexfield, PT, asked a great question: why is our focus on the frontal plane? That question helped focus our conversation around the necessity to get out of system extension, either unilaterally or bilaterally. And helped drive our conversation around the idea that if the frontal plane isn't intact, then transverse plane motion will occur in the incorrect location and manner, causing further compensatory patterns, some of which will result in more pathology. When it's time to be "Batman," be "Batman." But when it's time to be "Bruce Wayne," be "Bruce Wayne." And we need to be "Bruce Wayne" much more often on both sides than we currently are. We were fortunate to have a lot of lab time to focus on the value and application of the Hruska Abduction and Hruska Adduction Lift Tests. We were also very fortunate to be able to spend a lot of time in lab so we could experience several of the non-manual PRI techniques ourselves. The hamstring is the gate keeper of the gait cycle! My thanks to Nathanael Smith, ATC, CSCS, for being a great host and allowing us to use his awesome facility. New Mexico is just starting to gain traction in PRI, and it's exciting to see a facility like Nathanael's adopting PRI concepts. Meeting Nancy Allen , PT, was a real treat for me. She's been exposed to PRI for several years, and it turns out she grew up in South Dakota, not far from where I grew up! Small world! My thanks to Nancy as well for bringing along her co-workers, Karen Bexfield and Andrea Deyloff, so they could get their first taste of PRI. My thanks to Pat Fraser, PT, for her great questions. Thank you to Alanna Phillips, a PT student, for making the trip for her first PRI exposure. Thanks to Karen Russo, PT, Lukasz Sokol, and Nathanael Smith for letting us use you as our demonstration models. Thank you to Sandra West and Emily Blair, DC, for their enthusiasm and great comments. And thanks to Maritza Castro, ATC, for making the trip all the way from the Dominican Republic for the course! Giving a PRI course on occlusal positional consideration and occlusal influences on human positional sensorium and pattern was one of the highlights of my career and life. “After 45 years of ‘pre-dental major’ exploration, non-conformist intuitive processing and integrative pattern exposure and recognition and ‘irrational’ clinical appreciation that was built off of ‘effect and cause’ experience, “I was prepared to present ‘post –dental’ reasonings and recommendations. This first power point slide is powerful because it reflects my 45 years of pre-dentistry and the foundations of PRI. It is a course designed for dentists who are interested in patterned occlusion and its relationship to human patterned asymmetrical and functional limitation. This was the first time I gave this one day course – however, I have been preparing 45 years to discuss spheno-palatine influence on bite patterns, teeth behavior and personalities, the five meanings of ‘OA’ as related to that frontal plane, occlusal-calcaneal cortical function, and occlusal impact on dynamic freedom. I want to thank Jen Platt for her ‘first row’ student perspective and advice and for her patience and producer role, that she has perfected over the years of working with this director. Other shout outs to Hannah Janssen for her acting and functional performance and to Matt Hornung for his editing, visual production and camera mastery. Without my comrades at the Hruska Clinic, refinement and resolution of this vast subject matter would be tyrannical. Jason Masek MSPT, ATC, CSCS, PRC, Lori Thomsen MPT PRC, Torin Berge MPT , PRC, Dave Drummer DPT, PRC and Heidi Wise OD, FCOVD. Thank you for your patience, kindness and ongoing support. I love you all so much. I also want to thank Rebecca Hohl DDS MS, Chris Campbell DDS, Mark Vanicek DDS, Susan Christensen, DDS, and their respective staffs. Without their integrative mindedness and effort, the research that supports the didactic information provided by this course would have limited clinical significance and measurable outcomes. There I was in Hotlanta and as the rain poured down! 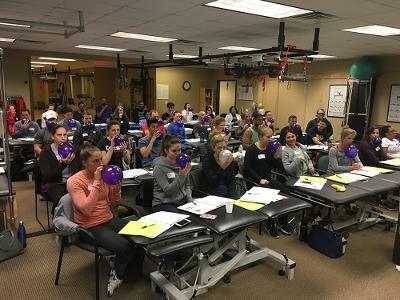 40 of us PRI nerds gathered at One On One Physical Therapy and spoke about all things Postural Respiration. I didn’t get to take very many pictures this time around because I was busier than a centipede at a toe-counting contest! Honestly, if I wasn’t answering questions...I was asking MORE questions. This audience was chock full of eager minds and new professionals visiting PRI concepts for the very first time. How honored I was to have the opportunity to go over the complexities of normal and abnormal respiration, the role of the diaphragm as a postural muscle and a respiratory muscle, rib kinematics as they relate to human asymmetry. I had two of my own former employees who are both Postural Restoration Certified (PRC) helping in the labs: Adrian Baker DPT, PRC and Kristin Spencer MPT, PRC. Adrian and Kristin were extremely helpful and valuable assets during the weekend and I am grateful to both of them. One On One Physical Therapy is a great host site and the facility was laid out nicely for a good class. Karen Davis Warren MPT, OCS, OTC made sure we had what we needed and I’m pretty sure she is planning on hosting another PRI course in the future. 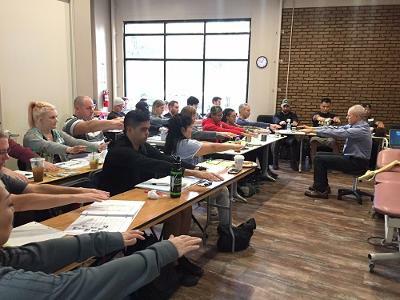 Present in the audience was Amos Mansfield ATC the head Athletic Trainer at Mercer University in Macon, GA. Amos is hosting Myokinematic Restoration at Mercer on March 3-4 and I would invite all to attend as this course dovetails very well with Postural Respiration. I look forward to seeing you all next month and in continuing PRI courses in the future. Let’s explore the science together! Cervical Revolution Seattle! How excited I was to have the opportunity to visit the world of Alpine Physical Therapy. My hosts and co-owners of Alpine: Eli Zygmuntowicz DPT, OCS, Jeremiah Ferguson DPT, OCS and Chris (Murph) Murphy DPT, OCS are three very strong PRI enthusiasts. These guys are the ones to watch as PRI progresses in the northwest. In their new and very modern facility we began a journey into the world of cervical spine management as well as cranial strain patterns and dental integration. On hand were 9 dentists, many of whom were quite familiar with PRI. Kent Moberly DDS returned for another round of learning and we also had many PRC’s and Takuto Kondo ATC, CSCS, DNSET, PRT was on hand too! 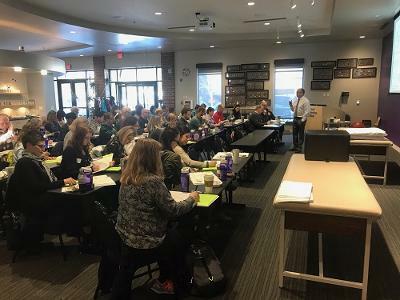 More and more people are enrolling in this class because, in spite of the daunting reputation that this course has, people are realizing that understanding the material is essential for adequate ability to successfully manage a significant number of patients who require a multi-disciplinary approach. By the end of this class, attendees were creating a local study group to continue what was started this past weekend! Dentists were excited, therapists were jazzed and I couldn’t have been more proud of them and the Postural Restoration Institute. I look forward to returning to Seattle someday soon! Oh and keep in mind that Postural Visual Integration is coming soon to Alpine Physical Therapy so register right away!!! PRI Integration for Geriatrics - Salem Oregon. Jacob Mullin and his growing team at First Call were very generous hosts for yet another PRI course. Old familiar faces like Ben, Mellet, Eric and John welcomed me back again after being a part of the 6 or 7 year training history with this organization. I am grateful that I have had the long term opportunity to learn so much with and from such a great group of passionate professionals. I love getting together with you guys because I know we are always going to laugh, learn and grow together. A big thank you to Tracey Blain for coming all the way from Anchorage, Alaska and to Valerie Chai for coming all the way from Kuala Lumpur, Malaysia. Yes, Malaysia. Your commitment to learning gave the rest of us perspective as we selfishly considered how hard it might have been for us to get up out of bed and drive across town to attend this course. And thank you Tracey for being an excellent example for the rest of the class as you demonstrated one of my all-time favorite techniques, appendix page 13. Gotta love the concept of going right to "get left" as opposed to going left to "get left". The new course title was a big hit for this group. The recent change to include the word "Geriatric" in the title and the words "Immobile, Frail and Chronic" in the subtitle really connected for the class. Many examples of using the material for immobile, frail or chronic populations were discussed and the adaptations made really good sense to the group. Loved all the integrated discussion and the constant reference to elements of and phases of the gait cycle. It was exciting for me to have such detailed biomechanical discussions about such frail, immobile or geriatric populations. 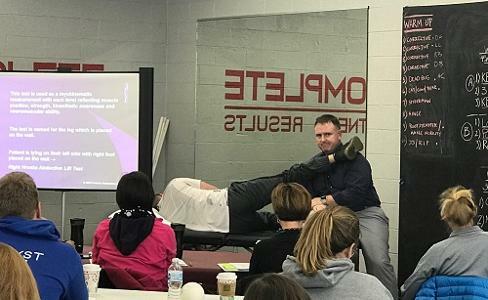 Michael Ball, PT, PRC was one of the lab assistants and he had a really good experience with this affiliate course material. After diving into the course and assisting with the new tests and techniques, he reported, "This course goes well beyond just treating geriatric populations. The appendix is filled with so many great integrated techniques. I now have more techniques to help my patients that may not be able to tolerate traditional PRI training. The seated assessment techniques were very useful in integrating all components of the gait cycle." Thank you Michael and thank you Mellet. I couldn't have asked for 2 more capable and willing lab assistants. The class was better because of you two. And thank you to everyone in attendance for such great questions and feedback throughout the course. The group based dialogue we enjoyed and the restates of key concepts throughout the course really enhanced what we all learned and were able to take home from this course. Until my next trip to beautiful Salem Oregon. Palm trees and a Santa Ana breeze was a refreshing respite for those who traveled from the cold parts of the country to Velocity in Redondo Beach Jan. 13-14 for Postural Respiration. Interdisciplinary was a theme as this course had P.T. 's, ATC's, D.C.'s, a D.C. Student, a DDS and an M.D. affiliated with UCLA who wants to learn PRI as part of a research project for high risk pregnancy. There was an added bonus: Chad Moreau, D.C., CSCS, PRC, the only other chiropractor who is a PRC, attended as a lab assistant. This was also the first time having two Chiro PRC's in the same course! Chad is a quiet force who also is a strength and conditioning coach for the L.A. Kings. His clinical expertise and insights to his approach with his athlete patients painted a picture of how to apply PRI to high level athletes. In addition, Miguel Aragoncillo, CSCS, PRT came out from Boston to assist. He is a PRT and will be entering PT school in the fall. Chad and Miguel made the weekend a success for all of the students. First time attendees can all relate to how overwhelming a primary course paradigm shift can be. This group asked questions (Shout out to Locatelli, Allyse, Beth, Waleed and everyone else!) that helped clarify scapular/rib positioning and TS/ST movement. This is a challenging issue for everyone then adding Superior T-4 on Sunday further paradigm shifts the group into the pathomechanics of respiration and rib/spine rotation. Thanks so much to Misao Tanioka for facilitating this weekend. She anticipated every need of the students and really helped make the weekend run smoothly. In addition, this was her first course as well! Needless to say, I love L.A.! 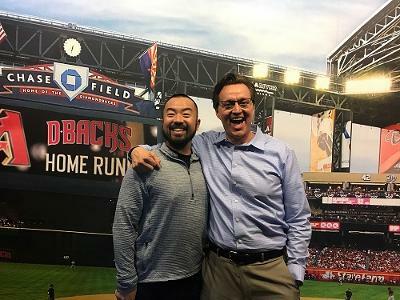 PRI Integration for Baseball (Phoenix Arizona) Another first class weekend at the Salt River Fields in Scottsdale Arizona teaching PRI Integration for Baseball with Ben Hagar, DPT, CSCS, PRC. A big thank you to the entire Diamondbacks staff for hosting a great event and making sure we had everything that we needed. Guys like Ryne Eubanks, ATC, Max Esposito, PT, ATC, and Joe Rosauer, MS, ATC were always a step ahead of us providing the necessary set up, food and drinks and the lab equipment we needed. Thanks guys. And thank you to Taylor Lewis, CSCS, PRT for serving as our lab assistant throughout the weekend. It was great to connect with some old friends and colleagues from my days living and working in Omaha, Mike Bartels, PT, PRC and Eric Pinkall, PT, PRC. Also great to see my PRC classmate and longtime friend from Minneapolis, Karen Jiran, MPT, ATC, PRC and to have her colleague Libby Lostetter, DPT, PRC attend with her. It was great to see some PRI regulars like Kim Hart, DPT, Keisuke Kanno, DPT, CSCS, and Brian Benjamin, DPT and also to get the opportunity to meet some new professionals like Jonathan Erb, PT, Hiroko Sato, ATC, Lilly Baker-Lubin, BASI, DNSET, MS and Terry Phillips, DPT. You guys were all fantastic additions to a great group and a great course. After introducing the class to the science of PRI and the patterned human body, Ben took over and went into the fundamentals of early phase and late phase throwing mechanics. He broke down the ideal mechanics for optimal performance and compared each phase of throwing to a phase of the gait cycle. He then used slow motion video analysis and the mechanical movement charts in the course manual to break down throwing dysfunction. He did the same thing for hitting mechanics and compared right handed player issues to left handed player issues. On the second day Ben introduced the three baseball performance tests, quadruped, sitting and standing. The lab experience allowed each attendee to get a good feel for the components of movement being tested with each test. We then then teamed up to break down the three thoracic rotational patterns and treatment recommendations for each. The treatment lab was heavily focused on Superior T4 Syndrome because of its high frequency in baseball athletes. The end of the course outlined training recommendations for early and late phase throwing for both right and left handed players. Another really great weekend integrating PRI with all things baseball. We are so thankful for all of you who have who supported us throughout the years. PRI will be closed to observe Thanksgiving November 23-November 26. Enjoy the time with your family and friends! This past weekend I had the pleasure of presenting Pelvis Restoration for the 3rd time in the last month! 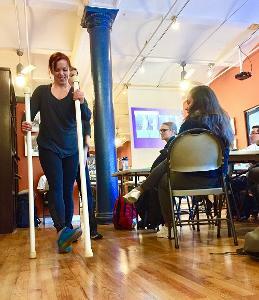 I did a course swap earlier this year as I couldn't pass up the opportunity to teach PRI in the Big Apple! My kids had a few days off from school, so we made it a family getaway. And..... My niece Kirsten who goes to school in Florida, just happened to be in the City with her Advertising club. There is nothing better than family and PRI! We spent a few days touring the city and eating our way around town. We took in a Broadway show and visited the 9/11 museum and memorial. It was a nice way to commemorate Veterans Day. Once the family fun was over, it was off to teach at Finish Line PT. This place is just so cool. I taught at this facility around 3 years ago. It is always great to teach again at the facilities that I have taught in the past. This group has taken on a passion for PRI and loves to host courses! Can't wait to come back again in the future. Pelvis Restoration is all about the frontal plane. I think I might have repeated the femur, pelvic outlet and pelvic inlet frontal plane relationships at least 25 times. I was going for 50, but I think they got it! This group of clinicians were not afraid to ask questions to better understand the material. I had a group of experienced clinicians and first timers that we affectionately refer to as "newbies" The newbies were definitely getting it! At the first break, I was approached by Courtney Pierre who was taking his 3rd PRI course. He was not certain he was understanding PRI, but after my initial remarks, his Ah Ha moments were happening and I am so glad he shared that with me. For those that have learned from me, I know you know how much I love to teach PRI and help bring people to a greater understanding of this integrated science. Pelvis Restoration is a great platform to begin a PRI journey as it is a bit integrated. Another special shout out goes to our token Pilates Instructor Maddy Kulesik. Maddy came to the course on the special encouragement from her parents Pat and Ellen. They just happen to be patients and clients of ours in NC. Maddy did great and loved her first PRI course. I don't think it will be her last. Way to go Maddy. Thanks again to everyone who spent their weekend with me at Finish Line. The staff were amazing hosts and made me feel right at home. This was my last course of 2017 and I will hit the road again in the summer of 2018. Thanks to Jen and Ron for giving me an extended break to spend with my daughter Madison as she will flying out of our nest and off to college next year. Until we meet again... Have a blessed Holiday Season and Happy New Year. If you ask any of our PRI faculty, the one thing that consistently makes every course enjoyable to teach is the course attendees. And the attendees in St. Louis for Myokinematic Restoration last weekend were no exception. It was a very rewarding experience to share the science of PRI to so many new health care professionals. We had 36 individuals who were experiencing PRI for the first time. We were able to navigate positions, patterns, and mechanics, while not forgetting that position dictates function. Moving on into myokinematic performance, we were able to solidify the concepts through examples of Boy Bands, the Hamstring being the Gate keeper of the Gait Cycle, and why being The Hulk all the time is not necessarily a good thing. My thanks to Rachael Durnell, Timothy McArthur, Damon Reel, Matthew Rosenboom, and Chris Wolbert for keeping us on track with their questions. Understanding the asymmetrical nature of the AIC pattern and how positional testing interpretation changes once that asymmetry is observed and appreciated can be a difficult task. However, this group took to this concept well. Which then allowed our progression through the Hruska Adduction and Abduction Lift tests to be a seamless transition. My thanks to Chris Matarazzo, Mark Coalson (Mark and I went to PT school together), and Ellie Huff for allowing us to use them for demonstration purposes. We had some powerful demonstrations that allowed us to see the neuromuscular influence PRI has on the human body. A huge thanks to Nancy Hammond and Leslie Callaham for their help during the entire weekend, particularly during the lab sessions. And another huge "Thank You" to our host site, Complete Fitness Results. What a great group of people, a fantastic space, and a very enjoyable weekend.